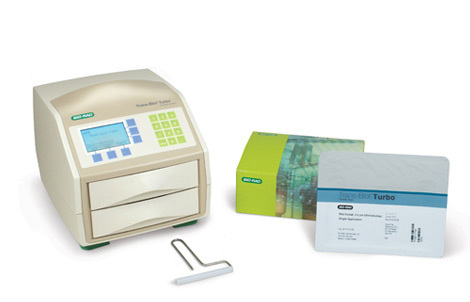 The Trans-Blot Turbo Transfer System is a high-performance western blotting transfer system designed to provide rapid transfers with high efficiency. The system enables blot transfer of protein in as little as 3 minutes without sacrificing performance when compared with traditional tank protein blotting. The Trans-Blot Turbo Transfer Packs include an optimized buffer, membrane, and filter paper combination that provides superior blot transfers when paired with the Trans-Blot Turbo blotting apparatus. Protein blotting consumables are available in a ready-to-use, pre-packaged stack or in bulk quantities that require assembly. Select the Trans-Blot Turbo RTA transfer kit for a low-fluorescence membrane option. Use Bio-Rad’s Precision Plus Protein™ WesternC™ Standards and Clarity™ Western ECL Substrate for chemiluminescence detection on both film and digital imagers. See how the Trans-Blot Turbo transfer system fits into the V3 Western Workflow™ to streamline your western blotting process.